At the Kennedy Space Center Visitor Complex in Florida, the "Space Shuttle Atlantis" exhibit opens on June 29, 2013. The spacecraft will be the centerpiece of a 90,000-square-foot building in which visitors will see Atlantis as it appeared in space. With the opening of the space shuttle Atlantis' permanent exhibit in Florida on Saturday (June 29), the last of NASA's retired space planes will be officially on display for the public to enjoy, but you'll have to go state-hopping to see all four of the iconic spacecraft. From Los Angeles to New York, the space shuttles have made their homes around the country. If you're looking for a good summer vacation destination, try visiting one (or all)of the orbiters that have been put out to pasture. Atlantis: Kennedy Space Center Visitor Complex, NASA, Cape Canaveral, Fla. Cost of admission: A viewing of the shuttle is included in the price of admission to the Kennedy Space Center Visitor Complex: $50 for adults, $40 for children (ages 3-11). Why to visit: The space shuttle Atlantis was the last to fly in space before the fleet was retired in 2011 and the final orbiter to be put on public display. Atlantis flew 33 missions, including secret missions for the U.S. military, flights to space stations and missions to launch several spacecraft into orbit. Atlantis was named after a ship that sailed for the Woods Hole Oceanographic Institute in Massachusetts between 1930 and 1966. That vessel was the first seafaring ship to image the seafloor using electronic sounding technology. 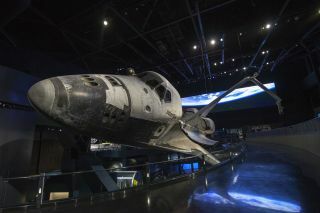 At the Kennedy Space Center Visitor Complex in Florida, Camp Kennedy Space Center participants get an up-close look at the space shuttle Atlantis during a weeklong summer activity for students entering second through ninth grades. Their tour took place just as final preparations were underway for the opening of the "Space Shuttle Atlantis" facility. The exhibit opens on June 29, 2013. Cost of admission: Due to damage sustained during Hurricane Sandy, the Enterprise pavilion at the museum is currently closed, but scheduled to reopen on July 10. Why to visit: Enterprise was the first space shuttle, but never actually flew in space. Enterprise was built without a heat shield or engines, making it incapable of spaceflight. It was used for drop tests and glide tests, giving astronauts a sense of what to expect during trips to and from space. To the glee of "Star Trek" fans everywhere, Enterprise was named after the venerable starship commanded by Captain Kirk in the original series. It was originally called Constitution, but after receiving tens of thousands of letters from people around the country, then-president Gerald Ford decided to rename the orbiter. Discovery: National Air and Space Museum, Steven F. Udvar-Hazy Center, Chantilly, Va.
Why to visit: The space shuttle Discovery launched for the first time in 1984. Although it was only the third shuttle to fly to space, it flew the most missions, 39 in total. Discovery was chosen as the "Return to Flight" orbiter after two space shuttle tragedies; once in 1988 after the Challenger explosion and then again in 2005 after the Columbia disaster. Discovery is responsible for launching the Hubble Space Telescope into orbit and was used to help build the International Space Station. This space shuttle is part of a long, historical tradition of naming ships "Discovery," NASA officials have said. Henry Hudson's Hudson Bay exploring vessel was named Discovery, as was James Cook's in the 1770s. Endeavour: California Science Center, Los Angeles, Calif. Cost of admission: Tickets reserving a timed slot are free, but a $2 service charge is applied to all tickets; $3 for telephone sales. Why to visit: The only space shuttle displayed on the West Coast, Endeavour was built as a replacement shuttle after Challenger was lost just after liftoff in 1986. The youngest orbiter eventually flew to space 25 times, making multiple trips to the International Space Station and one flight to Mir, the Russian orbiting laboratory. Endeavour got its name through a competition. A group of 6,000 schools in the United States competed to name the shuttle. NASA asked that the spacecraft be named after an "exploratory research sea vessel," and nearly one-third of the schools suggested Endeavour, the ship James Cook sailed to Tahiti while observing the transit of Venus from 1769 to 1771. Follow Miriam Kramer onTwitter and Google+. Follow us onTwitter, Facebook andGoogle+. Original article on SPACE.com.